If you asked that question of some of the best pro’s in the world, they would all be confident they’re going to hit a good drive. They might not be confident about the ball going straight down the middle, but they will all know they are going to strike the ball well. Conversely, if you asked that question to the average golfer they would choose b) Have no idea where the ball is going to go. When you’re walking down a flight of stairs you trust that when you thrust out each leg that it’s going to find the next step and you will walk down the stairs. you want it to do. But I bet you don’t have that same trust on the 1st tee, do you? Whereas a pro does have trust. If you watch a pro on the 1st tee very, very rarely will you see them hit a really bad shot. They might hit a shot way off line, but not very often will it be poorly struck. But if you watch amateurs tee off on the 1st you’ll see duffs, hooks, slices, dribblers etc. The bottom line is that the pro trusts his swing to hit good golf shots and the average amateur doesn’t. 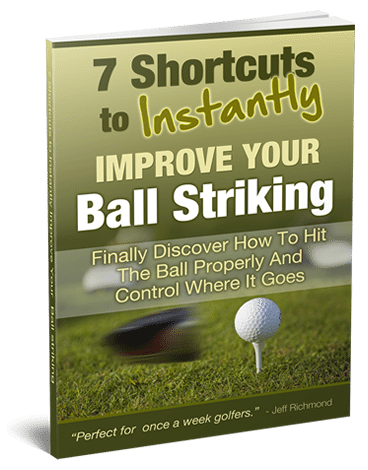 Now you may be thinking that the pro hits thousands of balls and that’s why they trust their swing. If that was true then they wouldn’t need to practice, would they? Yet, pros practice all the time. And if the average golfer practiced as much as a tour pro they would just make their bad habits more ingrained. So there’s got to be some missing link here. Why do tour pro’s trust their swing and amateurs, don’t? Well, I think it has to do with the image a professional golfer has of their golf swing. Take Jim Furyk for example. To everyone else it looks like Jim has a big loop in his swing. But when Jim was asked about it, he said it doesn’t feel like he has a loop in his swing at all! See, that’s what I’m talking about. Jim has won millions of dollars because he has a clear image in his mind of his golf swing. It might not be what we see but that’s irrelevant. Jim relies on what he thinks the swing should be and feel to TRUST his swing. Another example of this is Ben Hogan. Ben explained things in his swing that he felt like he was doing, but when you look at his swing in slow motion he didn’t do them at all. Why can these pros not feel a big loop in there swing or tell what they’re actually doing as they’re swinging? They are the best in the world. What hope is there for the average amateur golfer to trust their swing and be confident where the ball is going to go when standing up on the 1st tee? 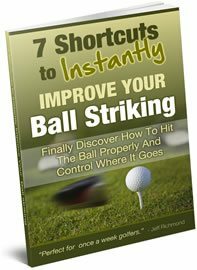 This secret technique is in my newly updated “15 Minutes To The Perfect Golf Swing” method that you can learn more about here. Imagine playing your next game of golf and being confident on the 1st tee that you’re going to hit a good drive. Or in other words, you trust your swing to hit a good shot most of the time. That can be your reality and it doesn’t need to take hours and hours of practice. In fact, like I said, if you spend hours and hours practicing you’ll probably just make your bad habits worse. So to improve you’re going to have to do something different. Go here to start that process now. Whether you get that program or not you need to learn how to trust your swing. You need to have an unwavering image in your mind as to how you want to swing. Trust in your golf swing is not going to come from changing your image on the golf swing every week.